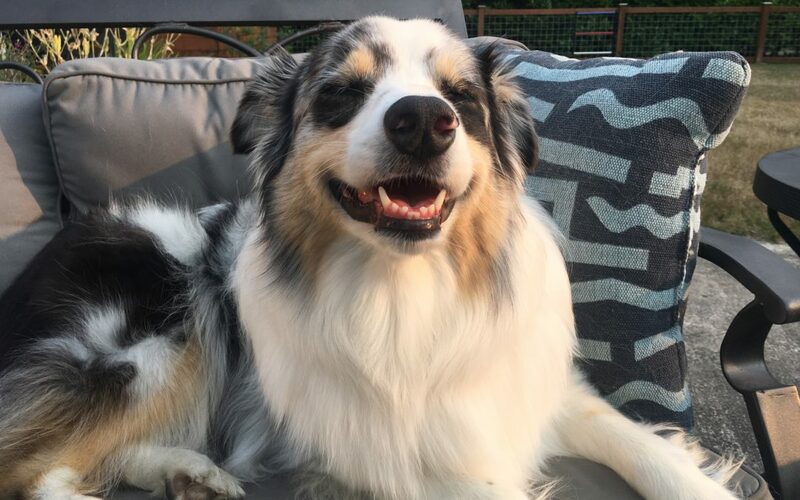 Fall 2018 Happenings at Silly Dog Studios! A friend asked me to host this and it’s something I myself need, so this is a no-brainer! If you’re looking for a place to write while surrounded by other working authors and writers, one-day per month, then this is the place is for you. We’re not a critique group. We’re a space where writers can write, breathe deeply, hang out, bump into each other, and get to know each other over time. A place where others will understand writer-us, even without words. 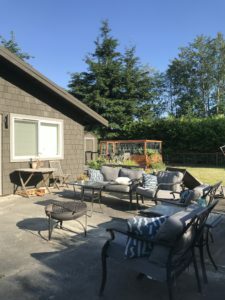 When the weather is nice, there are outdoor spaces to write here too, including super-secret introvert places hidden behind sheds and under trees. The indoor space will be mostly quiet with occasional quiet chit chat. If you want to have an extended conversation with someone, you can take the conversation into Lori’s studio. We imagine this space as a place where writers will feel welcome as they are and become friends—friends most of us deeply need to grow as writers—people who will gently hold each other’s feet to the fire by asking important questions like “How is progress on your book coming along?” and boosting our energy and spirits by actually deeply caring about the answer. FREE! This fall: September 5, October 3, November 7, December 5. Let me know you’re coming if you’d like or just show up and surprise us. Our long-time friend and essential oils expert, Lori Oviatt, will be giving a series of free talks here. The first one was a smashing success so we’re doing a few more! 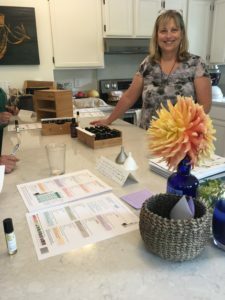 These free 90-minute talks will start on Saturday, September 8 and on Saturday, October 6, at 1 p.m. Are you curious about essential oils and their uses? Have specific questions? Bring them! FYI, Lori O will be selling DoTerra essential oils to anyone interested. You’re under no obligation to buy just because you attend. If this is something that might interest you, email me at lori@collectiveself.com so we know how many chairs to set up. Space is limited to 8 attendees per Saturday. FREE! We’re hosting a fun cross-disciplinary two-day workshop on sustaining our creativity and expanding and honoring our creative practice. This workshop is not a series of lectures on steps to follow but rather a community-driven sharing and relating experience. If you’re feeling like you just needed a jump start on your creative practice, or you want to take a brave leap forward and need a push, or even if you just need a creative battery recharge, this workshop is for you. It’s all about finding and re-finding our creative grooves. $300. If you’d like to attend one of these fun workshops in 2019, please let us know (including which months work best for you). We’re doing our 2019 workshop planning now. Gina’s bringing her wildly popular June workshop back in October! Yay! 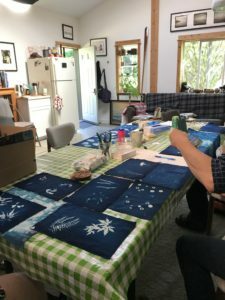 This one-day workshop covers the basics of how to coat natural fiber fabric with the photosensitive cyanotype solution. 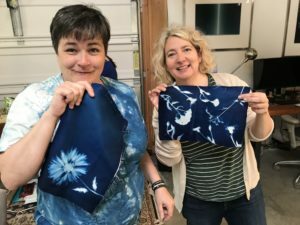 Then, how to use this super-fun process to make beautiful fabric art pieces that can be used as wall hangings, pillows, patches in a quilt, even book cloth that can be used to cover handmade journals. Come spend a day with us and explore the beautiful blue of cyanotypes in a fun new way! Materials included. (As I proved in June, actual photography skills are optional.- Lori) Cost: $100. For more information and to register, go to Gina’s site here. We don’t just live in the Pacific Northwest, we love the Pacific Northwest. To celebrate the area and our favorite time of year, we’re hosting a small workshop for 6 people to come up to the studio and spend time shooting photographs together in October. 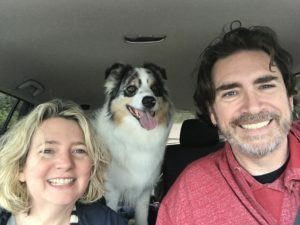 We’ll visit some of our favorite locations in and around Whidbey Island, the Olympic National Park, and the Skagit Valley. The entire area is an amazing place, and we will find the best places to visit. But this workshop isn’t just about shooting. We’ll also spend time in the digital darkroom looking at how to edit our files to get the best images possible. The price, which is $1,000 ($900 for early bird pricing) covers transportation once on location, guiding, instruction, and all printing supplies. For more information and to register, go to Daniel’s site here. This one-day workshop is all about getting the best of the printed image. Each workshop is broken down into two primary components. We spend the first part of the day covering specific aspects of the digital printing process. We spend the second half of the day printing. For more information and to register, go to Daniel’s site here. $125 per person, includes materials. Note: We will NOT be doing these until the wildfire smoke in the air here this August is long gone. We won’t be contributing to already-hurting lungs! 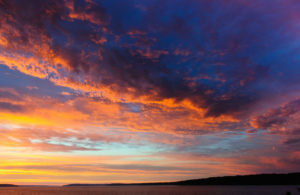 Whidbey is full of amazing artists doing amazing things: shows and talks and open studios and galleries, oh my! 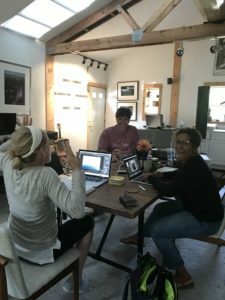 What we feel is missing here in our corner of this amazing place is a “remarkably relaxed space where we can deep dive into our own burning questions with other working artists.” And with that thought, our working artist bonfires idea was born. This is something we need, and we’re hoping we’re not alone. The “remarkably relaxed space” part means that these will be unscheduled and will happen/pop up as needed. Outside around the fire pit, as possible, and inside around the wood-burning stove otherwise. If we–or you–have a burning question (for example, something that stands between where we are now and where we want to be next as artists and humans), then we’ll have a bonfire. 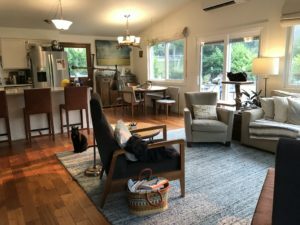 Also, we won’t clean the house or the studios for these events–you will see just how messy one photographer, one poet, one silly dog, and three cats can be. And if you want a drink, bring a drink. Want food, bring food. Want music, bring a guitar or voice or drums or something. The “working artists” part means that these won’t be advertised except via word of mouth and through social media. So, the more artists you know here on Whidbey, the more likely you are to hear about them before they happen. This means only working artists like us will show up. (At least in theory. This, like everything else we do here, is just an experiment.) FREE and BYOE (bring your own everything)! ©2018 Silly Dog Studios LLC. All rights reserved.